Warren Wiersbe said, “Unity and diversity must work together or one will destroy the other. Unity without diversity is uniformity, but diversity without unity is anarchy.” Jesus said in Mark 3:25 If a house is divided against itself, that house cannot stand. Unity is not just important. It is critical. When a nation or a church is not united, it becomes weak and will eventually self-destruct. However, I will confine my comments to the Word as It pertains to the Church, and particularly to us in this church. Ephesians 4:1-3 As a prisoner for the Lord, then, I urge you to live a life worthy of the calling you have received. Be completely humble and gentle; be patient, bearing with one another in love. Make every effort to keep the unity of the Spirit through the bond of peace. Paul says, “I urge you” to do something. What is that? “To live a life worthy of the calling you have received.” The word “live” literally means “as you walk around.” “Worthy” points to behavior that is suitable to the calling received. So, how do we walk around in a way that is suitable to our calling? Paul gives us five ways. First, we’re to be completely humble. We place the needs of others above our own. We don’t insist on our own way or that we have rights that need to be met. Philippians 2:1-8 Therefore if you have any encouragement from being united with Christ, if any comfort from his love, if any common sharing in the Spirit, if any tenderness and compassion, then make my joy complete by being like-minded, having the same love, being one in spirit and of one mind. Do nothing out of selfish ambition or vain conceit. Rather, in humility value others above yourselves, not looking to your own interests but each of you to the interests of the others. In your relationships with one another, have the same mindset as Christ Jesus: Who, being in very nature God, did not consider equality with God something to be used to his own advantage; rather, he made himself nothing by taking the very nature of a servant, being made in human likeness. And being found in appearance as a man, he humbled himself by becoming obedient to death— even death on a cross! Yes, we are to be completely humble. Second, we are to be completely gentle. Putting these two character traits together produces meekness. Meekness is not weakness or timidity. Both Moses and Jesus are referred to in Scripture as being meek. Meekness is great strength under control, like a powerful horse, that has been trained. The power is still there, but it is under control and channeled to be useful for the task at hand. In the case of a Christian, it is the Holy Spirit who is in control and He uses us for His purpose. He makes us completely gentle with others. Third, we’re to be patient. Patience is also a fruit of the Holy Spirit. Only with the Holy Spirit in control can we show patience in spite of suffering, especially suffering caused by other people. For a picture of patience under suffering, have you ever seen an older dog and a puppy interact with each other? The puppy is hyperactive, constantly nipping the older dog. What does the older dog do? He patiently takes it. No matter what kind of behavior the puppy exhibits, the older dog is patient in spite of the suffering the puppy causes. The older dog seems to understand and accept that the puppy is immature and will grow out of it. In the church, the Holy Spirit has given gifts to the body of Christ so that the immature can be patiently and lovingly taught how to grow up in every way into Christ. Fourth, we’re to bear with one another in love. It means that we endure other people’s weaknesses and pray for them. We share the truth with gentleness and kindness, giving the Holy Spirit opportunity to change them into the likeness of Christ. After all, they have endure our weaknesses until the Holy Spirit changes us. And all of this is done out of Christ-like love. What is Christ-like love? The term is agape, which we looked at when we took our test to see if we are in the faith. Agape means a self-sacrificing love on behalf of another. It’s easy to love people like us, but what about those who are different; what about those of a different political persuasion; what about those who are openly living in sin. Love is more than acknowledging them and saying, “Hello.” Love is wanting and working for what’s best for them, not necessarily in their eyes, but in God’s eyes. Fifth, we’re to make every effort to keep the unity of the Spirit through the bond of peace. “Make every effort” translates the idea that we should work quickly and diligently to keep the unity of the Spirit. It’s something that is important to maintain. We do it through the bond of peace. The word “bond’ signifies being tied together. 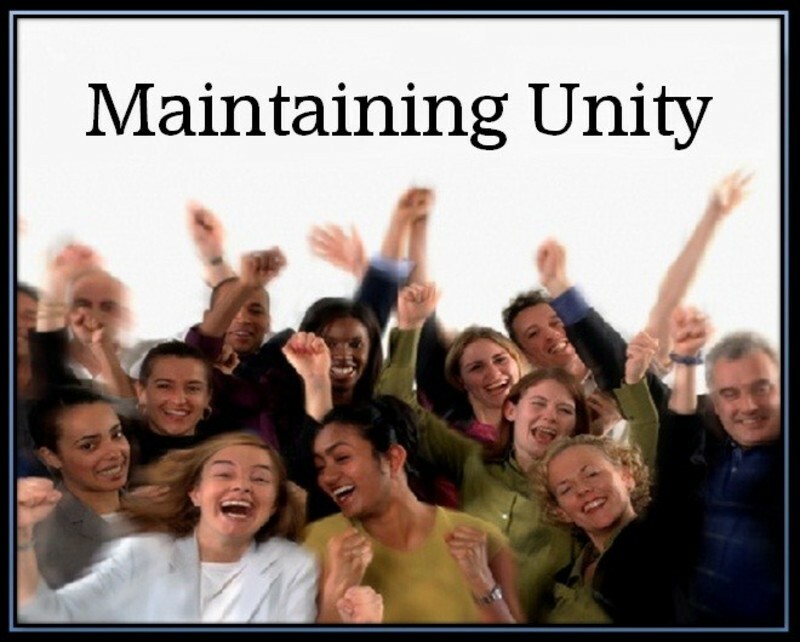 Every church member must contribute to the unity of the church. We have a responsibility as a church member to be a source of unity. Never be a divisive force. If you are, you are working for Satan. You are to love your fellow church members unconditionally. That doesn’t mean that you agree with everyone all the time. It does mean that you are willing to sacrifice your own preferences to keep unity in the church. Love is a fruit of the Holy Spirit. When we seek unity, we must die to self and seek the Holy Spirit so we can put on agape love. Without the Holy Spirit, we can do nothing but fail. 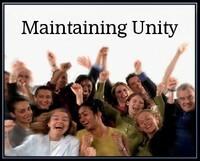 If you agree that unity is really important in our church, are you doing your part? Or have you been involved with gossip? As mentioned last week, few things can destroy the unity of a church more quickly than gossip. I will give a brief review. Gossip is when you’re sharing a problem or criticism with someone who is neither part of the problem nor part of the solution. When you listen to gossip, it taints your soul (mind, will, and emotions) and creates attitudes and thoughts that cause disunity. Gossip happens when we talk about people behind their backs. We pass along tales that might be true or might not be true. True or not, gossip never helps anyone. It harms the talebearer, the listener, and the person being gossiped about. There are two important ways to handle gossip. Number one, don’t be a source of gossip. If you have any doubt whether something is gossip or not, don’t mention it. If you request prayer for someone, don’t share all the “juicy” details—pray for their need (healing, perseverance, repentance, salvation, etc.) Keep your tongue under control. Number two, if someone begins to share gossip, gently rebuke them. You don’t have to be harsh in your response to them. Kindly say that unless the person has given them permission to share this, you would rather not hear it. And if that person has wronged them, then they should go to that person first, for you cannot help until they do. If we will do this, gossip will be curtailed and our congregation will be a place of joy and unity. Another way unity is destroyed is by constant criticism. Some people are never satisfied. Something is always wrong unless they are in control. Instead of being helpful and constructive, they condemn people, grumble, and complain. We appreciate suggestions for improvement, notifications of needs for repairs, requests for additional teaching material and equipment, and being kept informed about needs that people have. The motivation of these constructive reports is to bless the church and comes from goodness in our hearts. Conversely, gossiping, grumbling, and complaining come from the evil within our hearts. Sometimes a member will get hurt by something someone said or did. We talked last week about going to the person who sinned against you for reconciliation and not tell it to anyone else. Hopefully, that will resolve it, but unity will not happen if the members have unforgiving hearts. Forgive as the Lord forgave you. Have you given any thought about what that kind of forgiveness is like? There are three important principles about forgiveness in that parable. The first principle is that true forgiveness goes beyond any reasonable human limits. Like Peter, I have a hard enough time forgiving someone seven times. By then, I’m exasperated with that person and ready to be finished with them altogether. Again, that’s why I need to be filled with the Holy Spirit to obey this. After all, how many times has God forgiven me for repeated offenses? Jesus is saying, “Don’t keep score!” He’s telling us that we can’t place limits on forgiveness. Furthermore, it is easier to forgive repeatedly if we love one another, because love does not keep any record of wrong. The second important principle is that we have to remember just how much God has forgiven us. How much did this servant owe the king? 10,000 talents. One talent was approximately 6,000 denarii. A denarius was a day’s wage. 10,000 talents would therefore be the equivalent of 16.5 years’ wages for 10,000 men. We could say that the servant represents you and me. The king represents God. And when we realize just how completely God has forgiven all of our sins, it ought to produce an attitude of forgiveness toward other people. The last important principle is that we should forgive others as completely and lavishly as God has forgiven us. What happened with this forgiven servant? He went and chased down another of the king’s servants who owed him what would amount to a paltry sum when compared to the huge debt the king forgave. Here’s what Jesus wants us to learn. Forgiveness is much more for your benefit than for the person you forgive. If you want to be forgiven by God, you must forgive others. Each local church is made up of imperfect members and imperfect leaders. Church unity is torn apart when members refuse to forgive. Christ loved us so much that He died on a cross to forgive us. And now, as He has forgiven us, so we must die to self and forgive others. Then we will really enjoy life and the unity of the Spirit in the bond of peace. There is no better way to live. However, unless Jesus Christ is your Savior and Lord, this life is impossible for you. To receive His eternal life, you must believe Jesus is the Son of God who died on the cross to atone for your sin. If you believe that, you will confess it publicly and repent of your sin. Otherwise, you are just giving mental assent and don’t truly believe. True faith takes action! If you believe Jesus is your Savior and Lord, then you will confess it, repent, and give your life to Him by being baptized so you can be born again of the Holy Spirit. The Holy Spirit is the life of Jesus in you, and He will transform you and cause you to produce His fruit of love, joy, peace, patience, kindness, goodness, faithfulness, gentleness, and self-control in you. There is no better way to live.